How Do Bacteria Handle Microgravity? OXFORD, Miss. – A University of Mississippi professor soon will be sending bacteria to space with the aim of improving future spaceflights. 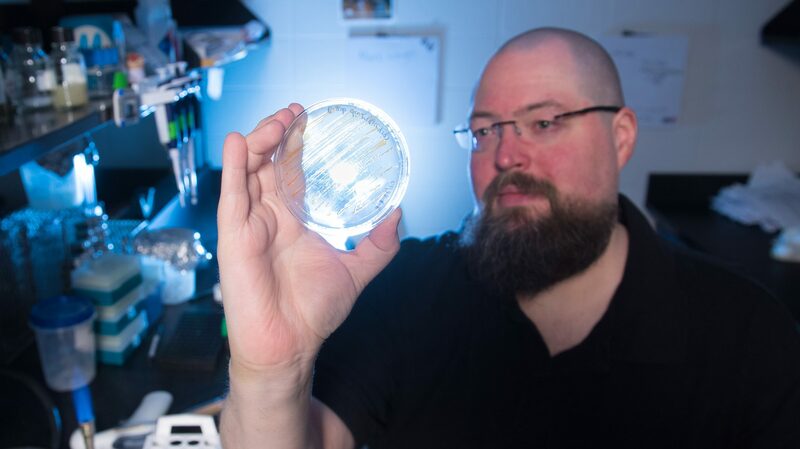 Patrick Curtis, an associate professor of biology, has been awarded an International Space Station, or ISS, Flight Opportunity Award, which will send bacteria grown in his UM laboratory to the space station in the coming years. The purpose of the project, titled “Assessment of Whole Genome Fitness of Bacteria under Microgravity,” is to better understand how bacteria respond in very weak gravity, which could possibly lead to better bacterial control mechanisms in space. These mechanisms could prove invaluable to maintaining both human and machine health aboard long-term spaceflights. “It’s pretty common knowledge that living organisms change in response to microgravity and spaceflight, such as humans losing bone density, but hardly anyone has looked to what happens to bacteria under those same conditions,” said Curtis, who joined the Ole Miss faculty in 2012. Bacterial biofilms clogged the water system aboard the former Russian space station Mir, Curtis said, so understanding how bacteria react to spaceflight is important for further space exploration. “The problem with previous studies is that they mostly focused on one or two specific aspects of bacterial life,” he said. “My laboratory is among the pioneers of a technique called TnSeq, which uses random mutagenesis and high-throughput sequencing to assess the usefulness of every gene in a bacterial genome under a given condition. The Flight Opportunity Award is granted through NASA’s Established Program to Stimulate Competitive Research, or EPSCoR. According to NASA, the EPSCoR objectives include contributing to and promoting the development of research infrastructure in areas of strategic importance to the NASA mission and contributing to overall research infrastructure, science and technology capabilities, higher education, and/or economic development. “We are excited that Dr. Curtis’ research will be sending his bacteria up to the International Space Station,” said Gregg Roman, UM professor and chair of biology. “Bacteria are part of every human ecosystem, which includes the ISS. The long-term colonization of space will require us to better understand how beneficial and harmful bacteria respond to microgravity and grow in space. The project will “ask” a few different bacteria to list all the things important to them during spaceflight, Curtis said. Curtis is recruiting a graduate student to work on the project, who should begin in the fall. Also, more testing and optimizing of the project are needed before the project is ready to head to the ISS, so his best guess for when the bacteria will be aboard the space station is one to two years from now. The project is funded for $100,000, and Curtis serves as the project’s co-principal investigator. The project’s principal investigator is Nathan Murray, senior scientist for aeroacoustics, with the UM National Center for Physical Acoustics, or NCPA, and director of the Mississippi Space Grant Consortium. The consortium is a statewide nonprofit organization of higher learning institutions with the mission of enhancing and supporting aerospace science and technology efforts and activities in Mississippi. “The process of getting an experiment packaged, prepared and certified for flight on the ISS is unique and nontrivial,” said Murray, who also works as the associate director for program development at NCPA and as a research assistant professor of chemical engineering. “It is extremely valuable to learn from someone who has already gone through this process successfully. The award, based upon work supported by NASA under award No. 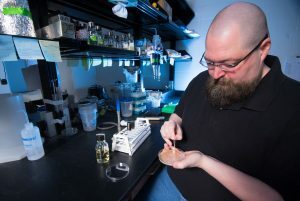 80NSSC19M0013 and funded from Aug. 1, 2019, to July 31, 2021, continues Curtis’ high-profile research at UM. In 2016, he received a Faculty Early Career Development Award from the National Science Foundation for his research on “Investigation of Conserved Global Regulatory Systems Using Cross-organism Comparison.” The award, for $767,103, is funded through February 2021.